The aim of this project is to provide a comprehensive picture of the main trends ahead and possible disruptive global challenges in the future and to examine how the EU could position itself to take an active role in shaping a response to them. The work described in the final report contributes a fresh perspective on the future, linking widely accepted quantified trends through 2025 and beyond with the opinions of experts and policy makers on the likely consequences of these trends and wild cards. This work has been undertaken in cooperation with the Bureau of European Policy Advisors of the European Commission. What will the world look like in 2025 and beyond? What are possible future disruptive global challenges? And how can the EU position itself to take an active role in shaping a response to them? There is a clear and growing need for the ability to anticipate change to be embedded in policy. This is critical not only for being able to respond and adapt to new situations before they occur but also to shape the future, building upon mutual understanding and common vi-sions to be jointly pursued. For policy responses to address all the pressing current global challenges, especially when seen in isolation, is clearly a demanding task. Institutions face greater com-plexity and difficulty in providing solutions in due time. This is particularly true when the policy focus extends beyond the challenges that societies face today, seeking to anticipate future challenges and transform them into opportunities. 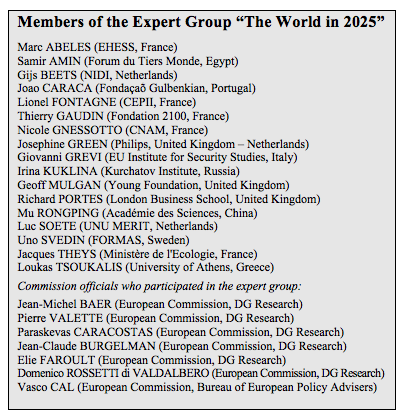 This is the rationale for the study “Facing the future: time for the EU to meet global challenges” carried out by the European Commission’s Joint Research Centre, Institute for Prospective Technological Studies (JRC-IPTS) for the Bureau of European Policy Advisors of the (BEPA). 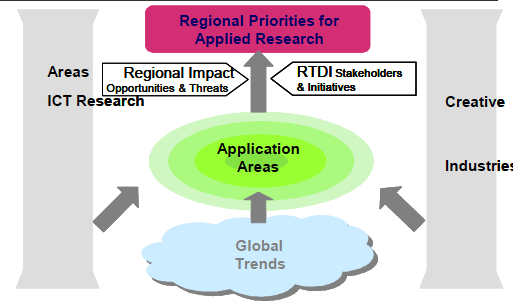 The methodology used combines an extensive analytical review of more than 120 recent future-oriented studies, followed by a broad online consultation of almost 400 identified issues in six policy-relevant areas and use of multi-criteria quantitative analysis (Robust Portfolio Modelling) to prioritise the resulting issues. Key issues were then presented and discussed in a workshop with selected experts and policy makers. The main objective of the expert workshop was to organise the findings of the literature review and the analysis of the online survey into novel cross-cutting challenges, which the EU needs to tackle now in order to secure a better future for all and to translate them into policy messages. As a wide variety of challenges emerged related to the future of the world in 2025, the criteria of urgency, tractability and impact were used to prioritise and select the most relevant ones. Following the methodological approach above, three key challenges with a global scope were identified at the end of the expert workshop. Their multiple dimensions are articulated below. This global challenge relates to the human over-exploitation of basic natural resources, which are essen-tial for societies to function and evolve in a sustainable manner. Current conditions and patterns of behaviour need to be reflected, and policy actions supporting the shift towards sustainable ways of living should be fostered and strengthened. The long-term sustainability is key to ensure not only economic growth but also a better quality of life for all current and future generations. This depends on the intelligent use, conservation and renewal of natural resources and ecological systems. All human activities both depend and have an impact on natural resources. Food production, for example, is highly dependent on water and land and its processing and distribution depends on energy. All industrial activity starts by extracting natural resources and then assem-bles them in different ways to add economic value, while using energy and generating waste along the chain. The chain ends with the disposal of final goods at the end of their product life. The provision of services also impacts on natural resources. Climate change and its manifold effects on water and other natural resources, agriculture and food se-curity, ecosystems and biodiversity, human health and migration patterns (IPCC, 2007; UNEP, 2007). A dramatic increase in water scarcity in many parts of the world partly due to climate change and partly due to excessive withdrawals and contamination of surface and ground water, with profound implications for ecosystems health, food production and human well being (WEF, 2009; WWF, 2008). The decline in the geographical distribution and abundance of arable land, freshwater and marine biodiversity is progressing more rapidly than at any other time in human history, with humanity moving in the direction of crossing tipping points since changes in the biophysical and social systems may continue even if the forces of change are removed (WWF, 2008). A possible global energy shortage due to increas-ing demand and consumption, which will lead to a rise in global competition for energy resources as well as a greater dependency between nations, with energy in general and oil in particular playing a key role in future power relations and defence policies (European Commission, 2008; OECD, 2008). Increased demand for food due to a growing world population, rising affluence, and the shift to Western dietary preferences (World Bank, 2007); this will place more pressure on water for agriculture and have a strong effect of high food prices. Climate change, water scarcity and lack of food at affordable prices will be important factors in the in-crease of illness and death rates in developing countries (IPCC, 2007), which will lead to a deepen-ing in poverty and exclusion linked to the unsustain-able exploitation of the natural resources still avail-able, mass migration as well as threats in the form of radicalisation and terrorism (United Nations, 2008). Rising employment rates will no longer be sufficient to compensate for the decline in the EU working population due to ageing and a change in skills needed to function in knowledge societies, leading to economic growth being mainly dependent on in-creases in productivity. Ageing societies are placing increasing pressure on pension systems, social security and healthcare sys-tems (European Communities, 2008). Increase in continuing flows of migrants from de-veloping to developed countries due to environmental hazards and armed conflicts as well as aspirations to a better quality of life. Education and information and communication tech-nology (ICT) innovations could lead to a shift towards citizen empowerment and e-governance with citizens holding governments accountable due to an increase in transparency, but this is at risk of failing to become reality since the majority of the world population is still excluded from having access to the knowledge society. Innovations limited by social acceptance due to a lack of education, transparency and societal un-derstanding of technological possibilities. New converging technologies that emerge from multidisciplinary collaboration are expected to drasti-cally change all dimensions of life (RAND, 2001). In relation to globalisation, it is expected by 2025 that the world will comprise many more large economic powers. China, India, Japan, Korea, Malaysia and In-donesia will take on greater significance in the global economy (EIN, 2007) and their huge consumer-driven domestic markets can be expected to become a major focus for global business and technology. Single policy governance approaches can no longer cope with global issues, leading to fragmented responses to common challenges that are complex and interconnected. 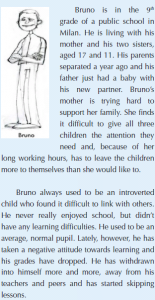 This is linked to the lack of a single nation’s ability to keep up with the pace of socio-economic change and the reliance on reactive, individual, unaligned and inflexible strategies (Florini, 2005). The problems faced by developing countries also increasingly become the problems of developed economies, such as the EU member states, as a consequence of increasingly fading borders between nations due to terrorism and conflicts (i.e. over natural resources) and migrations caused by pandemics and poverty. Mainly thanks to ICT-related innovations there is an increasing shift towards empowerment in govern-ance. The use of the Internet is now moving towards the use of Web 2.0, with applications such as social networking, blogs, wikis, tagging, etc., and this supports a trend towards networked computing and e-governance systems (Accenture, 2009). Many rising superpowers, such as Russia, China, the Middle-East and some Latin American countries, have widely differing traditions in democratic gov-ernance, which may cause pressures on democracy also elsewhere. Western norms and values, as the foundation of the global system, could also be challenged by radical religious identity politics that might emerge as a powerful counter-ideology with wide-spread appeal. The growing strength of emerging economies in-creases pressure to integrate them more closely into international coordination processes. Unbalanced representation of nations in global fora, such as the UN, WTO and IMF, makes it impossible for many developing countries to participate in global decision-making processes and to implement or adopt strategies that are decided only by the economically powerful countries (Amanatidou, 2008). life, and the labour market needs of especially ageing societies; and a change in the policy paradigm based on GDP to an updated system that also considers ecological flows and stocks. Social diversity and ICTs towards citizen empow-erment – including the need to build new incentives to facilitate and strengthen relationships between dif-ferent social systems; develop the necessary means to enhance education on the use of ICTs in conjunc-tion with other technologies; improve the quality of education by, for instance, fostering competition within and between EU national education systems; regulate the healthcare system, tapping into new technologies to provide equal access for all; develop radically new and far more efficient forms of social protection; and enhance regional specialisation through the formation of regional RTDI clusters. Anticipation of future challenges to turn these into new opportunities – including the need to em-bed forward looking techniques in EU policy making; foster mutual understanding through ongoing and in-clusive dialogue both within the EU and worldwide to build shared values, common visions, actions, and smart regulations, and enable effective and adaptive international organisations to become a reality; estab-lish partnerships between industry, government and society; clarify at global fora the role and status of the EU and balance its representation in international or-ganisations; and foster (e)participation and (e)democracy through the use of web 2.0. 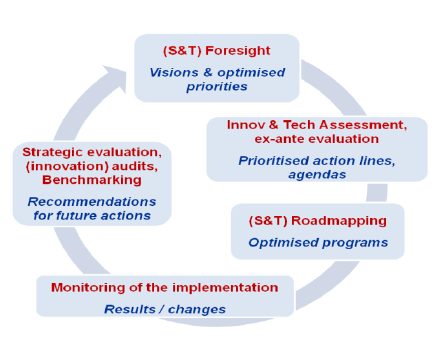 The foresight approach employed in this study contrib-utes to policy making by supporting a continuous and shared approach to understand the present in all its complexity, to look at different future possibilities and to shape a joint direction to follow while considering differ-ent stakeholders’ points of view. This can be coupled with a periodic evaluation of what has or has not been achieved to enable policy to correct deviations and to continually adapt to and re-shape upcoming new situa-tions. It is believed that such an approach, linked to other forward-looking techniques and tapping into evi-dence-based research and quantitative elements, would be critical to enable EU policy making to become more adaptive and able to anticipate and address change. The full bibliography is available in the final report on http://ftp.jrc.es/EURdoc/JRC55981.pdf. Accenture. 2009. 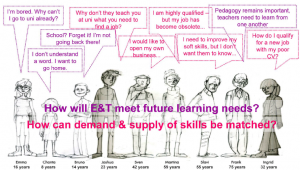 Web 2.0 and the Next Generation of Public Service. Accenture. Amanatidou E. 2008. The Role of the EU in the World. EFMN Brief 133, http://www.efmn.info/. European Communities. 2008. The 2009 Ageing Report. European Economy 7/2008. EIN. 2007. 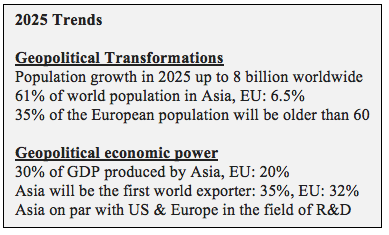 The world in 2025 – how the European Union will need to respond. Discussion Document. European Ideas Network: Brussels. Florini A. 2005. The Coming Democracy – New Rules for Running a New World. Brookings Institution Press: Washington DC. IPCC. 2007. Climate Change 2007 – Synthesis Report. An Assessment of the Intergovernmental Panel on Climate Change: Geneva. OECD. 2008. World Energy Outlook 2008. Organisation for Economic Co-operation and Development: Paris. RAND. 2001. The Global Technology Revolution – Bio / Nano / Materials Trends and Their Synergies with Information Technology by 2015. RAND: Santa Monica. UNEP. 2007. Global Environmental Outlook (GEO4) – Environment for Development. United Nations Environment Pro-gramme: Nairobi. United Nations. 2008. Trends in Sustainable Development: Agriculture, Rural Development, Land, Desertification and Drought. United Nations: New York. WEF. 2009. World Economic Forum Initiative: Managing Our Future Water Needs for Agriculture, Industry, Human Health and the Environment – The Bubble is Close to Bursting: A Forecast of the Main Economic and Geopolitical Water Issues Likely to Arise in the World during the Next Two Decades. World Economic Forum. World Bank. 2007. World Development Report 2008 – Agriculture for Development. The World Bank: Washington DC. WWF. 2008. Living Planet Report 2008. World Wide Fund for Nature.